My name is Susan Espinoza. I am 48 years old, and I am a breast cancer survivor….and Spartan Race saved my life. I do not win money. I win a medal and a picture on the podium. I want to show women across the country that you can do anything you put your mind to. Even when you think cancer is going to take your life… it is not the end… you can push through it, heal, and become a better and stronger you. 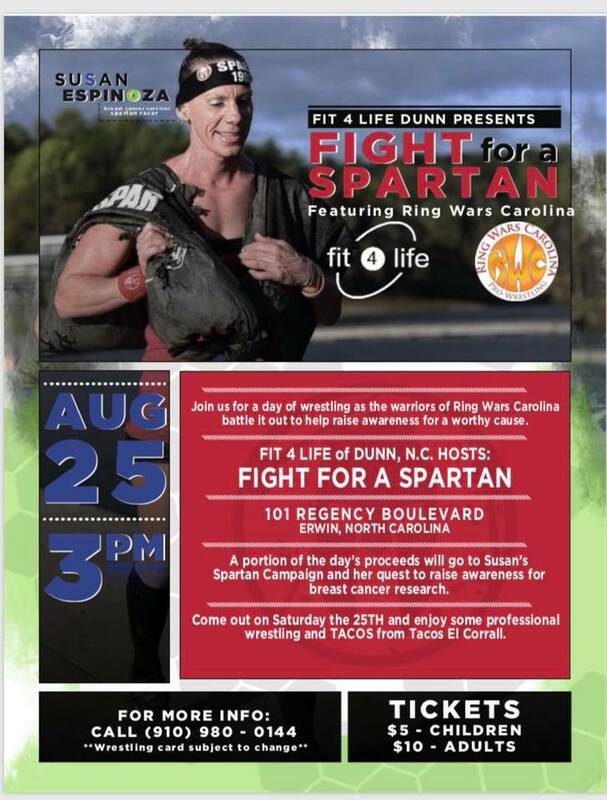 Thanks to Fit4Life in Dunn and Ring Wars Carolina for putting this "fun-raiser" together. A portion of the proceeds will go to help raise awareness to Breast Cancer Research. Please join us Aug 25th at 3pm as Fit4Life & RWC Pro-Wrestling presents "Fight For A Spartan"!